From undesirable women to the size of your measures, from beer (but no spirits!) 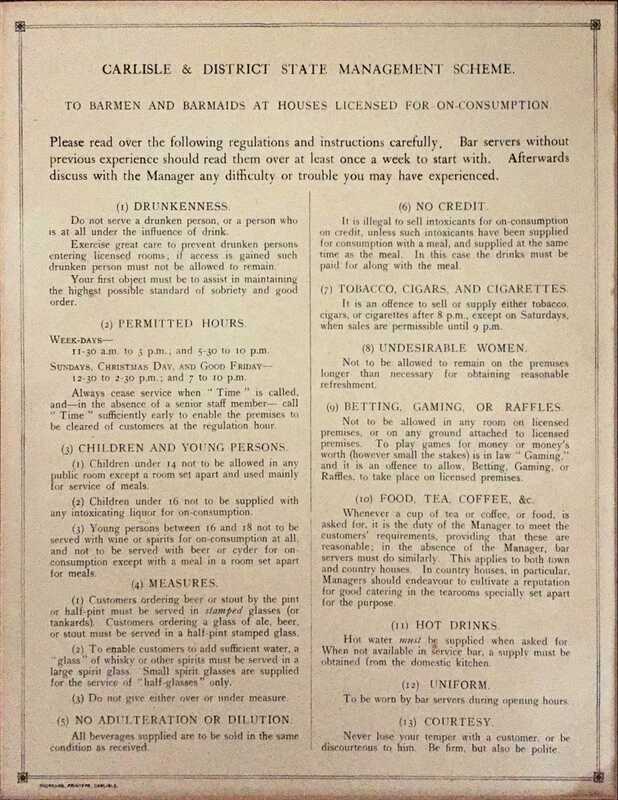 for the youngsters to mandated hot beverages, the rules and regulations of the Scheme would have been displayed prominently in each establishment. Click and drag the magnifier to make the rules more legible. Take note, new visitors must read the instructions at least once a week! The Manager shall keep the licensed premises scrupulously clean and the rooms used by the public properly ventilated and warmed when necessary. The scheme of charges fixed by the Board for letting of rooms and lodgings shall be strictly adhered to. The Manager shall not let rooms or lodgings unless authorised to do so by the Board. No wages shall be paid on the premises except to those employed in the house. Neither the Manager nor his assistants shall smoke during opening hours. The Manager shall not adulterate or dilute any of the wines spirits malt liquors or food which may be supplied to him for sale to customers. The Manager shall under no circumstances either or indirectly receive from any persons supplying any goods or dealing with the Board any gift bonus or commission or benefit of any kind whatsoever. The business carried on at the aforementioned premises shall be cash or ready money business only and credit shall not be given or allowed to any customer. No “ring paper”, “ring book”, or any certificate or warrant for the payment of any pension, separation or any other allowance by the War Office, Admiralty or any other Government Department, or by any Public Body, no Army Certificate, advance note, pawnbroker’s duplicate ticket or any other document article or thing shall be received purchased or taken as security from a customer or other person. The Manager shall not advance money to customers or cash for them. No gaming and no raffle of any description shall be allowed to take place on the licensed premises or on any grounds occupied therewith. The Manager shall not, without the express permission of the Board, supply to any person who is not an official of the Board any information or give replies to any questions concerning the licensed premises or the business carried on therein or the wages of the Manager or his staff or the terms of his or their service. All letters, books, invoices and other documents received or kept by the Manager in connection with the business of the licensed premises are the property of the Board and are strictly private. The Manager must carefully preserve all such papers as are not transmitted by him to the Head Office and will be held entirely responsible for their production when required. All monies received by the Manager in respect of the sale of goods to customers or otherwise in relation to the business shall be banked daily or otherwise as shall be directed by the Board. The Manager shall exercise the greatest possible care to prevent drunken persons entering the licensed premises and shall not permit a drunken person to remain on the premises or sell or serve intoxicating liquor of any kind to a drunken person. The Manager shall not open or keep the premises open during prohibited hours. The Manager shall use all possible means to prevent excessive drinking by customers and shall carefully observe the demeanour of all customers who remain in the house for a prolonged period. He shall also satisfy himself as to the complete sobriety of a customer before allowing him to be served with any intoxicating liquor. No messenger known to be sent by any person who has been refused drink on the premises shall be supplied. The Manager shall not sell or allow to be sold to any person apparently under the age of eighteen years for consumption on the premises (i) spirits of any description (ii) ale, beer, stout or porter except for consumption with a meal. The Manager shall duly observe and be wholly and solely responsible for the observance of the provision of all Acts of Parliament relating to the sale of liquors and to licensed and licensed premises and shall do all things necessary to comply with and observe the same and shall also comply with and observe the Orders of the Board now in force relating to the sale and consumption of liquors and any future Orders which may be made. The Manager shall not give any entertainment or permit any entertainment to take place upon the licensed premises without the consent of the Board and without the requisite legal authority (if any) recognised for the purpose. The Manager shall not permit any trade or other advertisement to be exhibited either in or on the premises without the permission of the Board. The Manager shall not sleep away from the premises, not be absent during business hours on private business without the consent of the Board nor shall he be a member of or become a candidate for any County, Borough, District or Parish Council, Board of Guardians or other public body, corporation or committee or be a director or engage in any other employment whatsoever without the consent of the Board. The Manager shall not be the secretary, treasurer or any other official of any club, society or other organisation which holds its meetings or the meetings of its committee at the premises of which the manager is in charge. The Manager shall not fell nor cut any of the timber or ornamental shrubs (if any) without the consent of the Board in writing. Except with the consent of the Board not more than one dog shall be kept in or about the premises. No person except those employed in or lodging in the house shall be allowed to remain on the premises during closing hours. If the Manager shall accept parcels or goods of any description from customers or others for safe custody he shall do so at his own risk and the Board shall not be held responsible by the owners thereof for any loss or damage suffered in respect of such parcels or goods. Managers of premises to which no livery stables are attached shall not accept parcels or goods for safe custody.